This should be the age of personalisation, where companies send communications that are both personal and personalised to each of their customers, as appropriate. 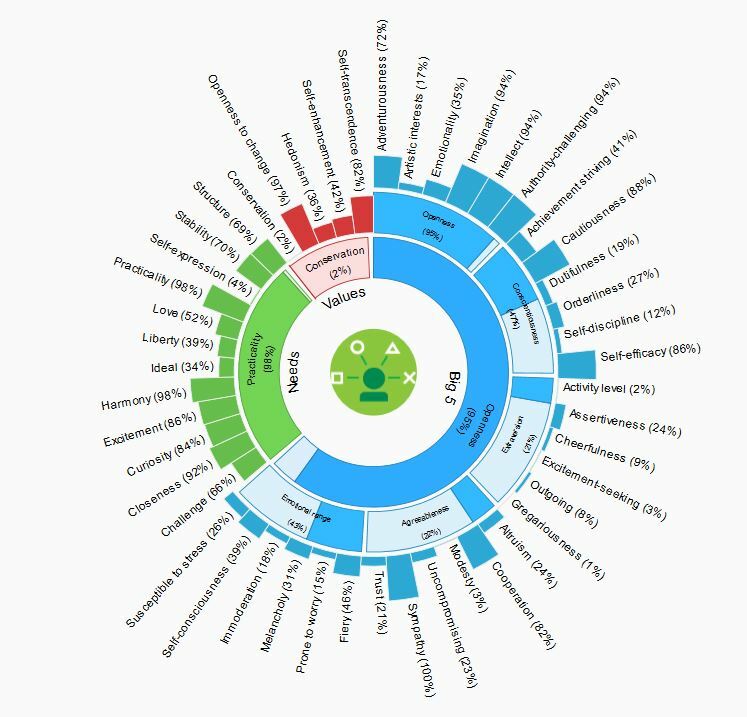 One of my favourite ways of doing that is using Personality Insights Service (some may know of it by its previous name of Watson User Modeling), a service that allows you to understand a person’s personality, needs and values from a variety of inputs of your choice (such as Twitter, other social media, and even your recordings of customer calls). These characteristics are categorised into approximately 50 traits (see an example diagram below), and you can use these to understand which of your products or services are most likely to be attractive to a person. For example, someone who has a high score against “self enhancement” may be more likely to purchase products that would support that value. So perhaps they would be more likely to buy a clothing retailer’s designer or high quality ranges. Or may be someone who is likely to purchase wearable technology for improving their health and lifestyle. Of course, there are other ways to use social media data to personalise – such as through knowing what a person has liked in facebook, or when they are sharing information about events in their life in twitter, and so on. That access to a customer’s social media data is surprisingly easy to get these days. One study has shown that 38 percent of shoppers are willing to share their social handle. Another way to tie a social network ID to a customer ID is to use a service such as that provided by Gigya that provides a customer identity management platform to register and identify customers across your sites and apps, using their social media accounts. Unfortunately I’ve been hearing about some companies who are not applying any sort of intelligence at all. They are simply using their access to a person’s social media ID to find out the IDs of that person’s contacts and spam them too. Is that not what some email viruses do? Don’t they access your address book and then spam all your contacts to spread the virus further? The 50ish traits analysed by Personality Insights.